Click on this button to add the accelerator to IE8. 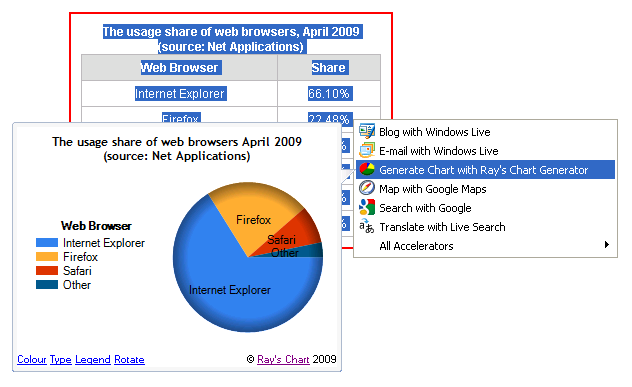 Ray's Chart allows you to generate charts from table data on web pages. 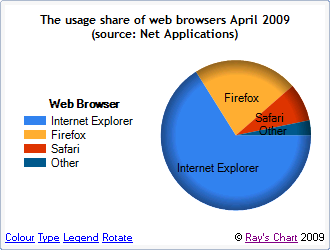 Select any data table on a web page and a chart will be generated for you using that data. You can also customise it by changing its type, colour and other settings. Follow instructions in the Try It Now section on the left and you will get this chart. Customisation is done using button controls in the left bottom corner of the window. By clicking on menu item you can navigate to Advanced chart generation page. Here you will be able to perform more customisations and print or export the chart.